You remember Woody. Woody was my college buddy, former roommate and BGE comrade. He's also the guy who taught me about Mountain Dew-brined turkey He and I got to trading texts on Friday. The forecast for the lovely fall weekend was calling for 100% chance of Eggin' in his back yard. We were discussing what to cook. He was so excited about the outcome that he offered to post the following entry here. When I heard how it all came out I grew sad that we only talk about Egging and don't have opportunities to, you know, hang out--and like eat his stuff, too. Sounds awesome. Way to go, Woody. 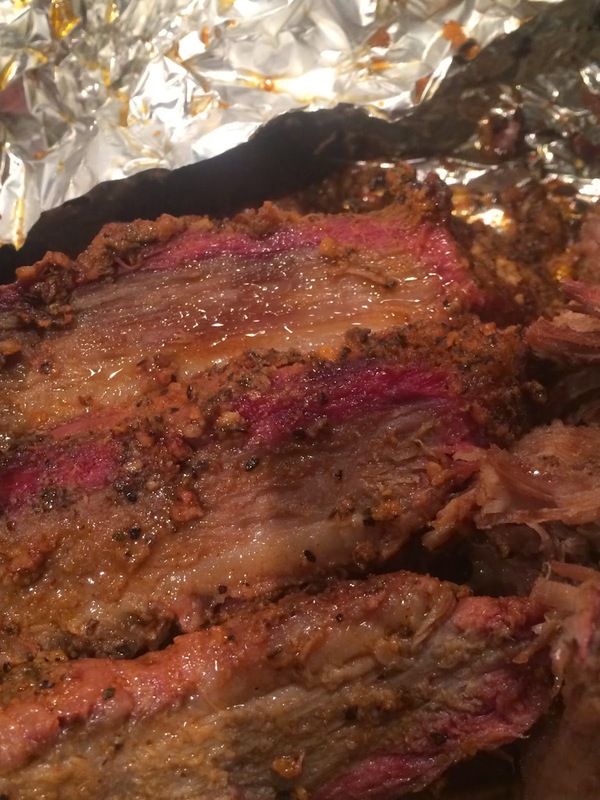 It is with gratitude and a watering mouth that I present Woody's weekend brisket adventure. · I didn’t trim any fat from either cut. Other than the fat cap, they were fairly lean. Took out of plastic wrapper and rinsed in cool water. Patted dry with paper towel. Slathered it with decent layer of Mister Mustard Hot Mustard. Wrapped tightly in saran wrap and put in fridge overnight. Took out of fridge, unwrapped and set on counter for 45 min before putting over heat. Added more rub just prior to putting on BGE. Used plate setter and placed an aluminum drip pan on it with an inch or so of water in the bottom. Brought BGE up to 250F. Was a dry, cool, breezy day. The wind kept my temp dancing at times. I would say the temp was more in the 260F range the majority of the time. 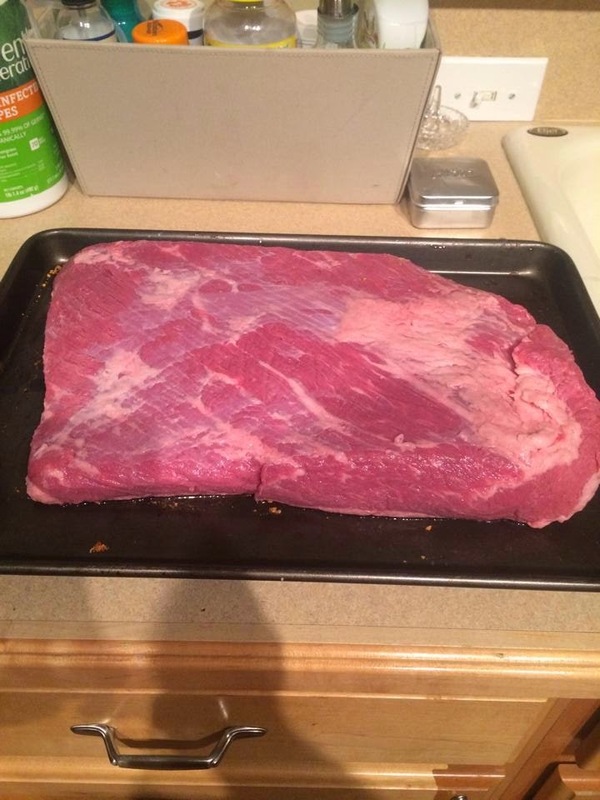 For lack of space reasons…I started with the larger piece of brisket. Placed on grate fat cap down. Took about 6 or so hours to get the meat to plateau temp of 165F. Then double wrapped the meat in foil and placed back on BGE to finish. The larger piece had finally shrunk enough where I was able to fit the smaller brisket on at same time. Moved main temp probe to the smaller brisket and periodically checked the foil wrapped meat with Thermapen. Pulled larger brisket when internal temp hit 200F and the Thermapen pushed into the meat with ease. It took another 2 hours or so to push temp up. Kept it in the foil and wrapped it in two towels and placed in microwave to rest for a three hours. Followed same protocol with small brisket (took about 4 hours total) but was only able to let it rest for an hour before carving. Slice the meat across the grain. Marnie says it was the best low and slow meat I have cooked on the Egg. The larger brisket had great flavor. The meat fell apart very easily which made slicing tough. Probably over cooked it a bit, but the meat was very moist and could chop it easily. The smaller brisket had a perfect smoke ring. It sliced much better. 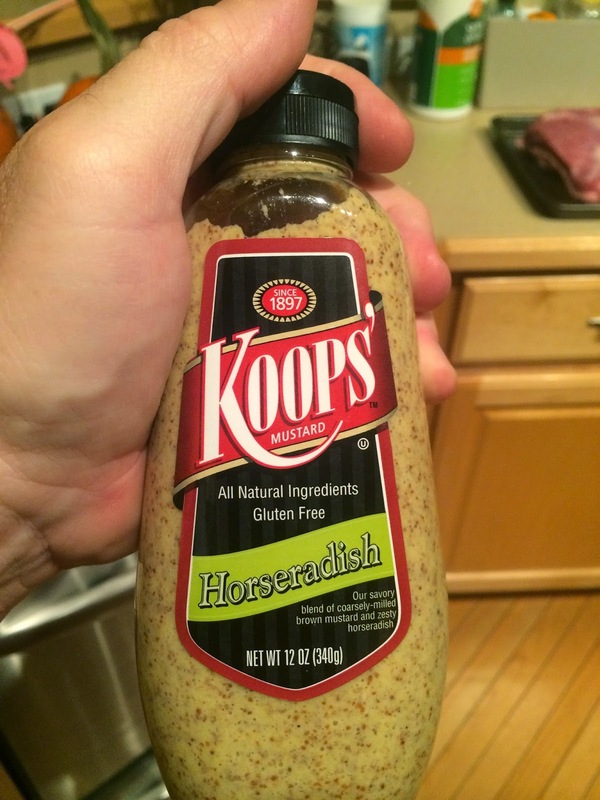 The horseradish mustard gave it some awesome flavor.